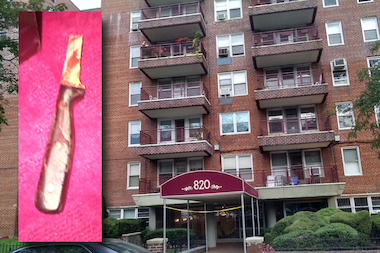 Police shot and killed a knife-wielding man inside an Ocean Parkway home, the NYPD said. MIDWOOD — A knife-wielding man barged into his terrified ex-girlfriend's apartment while her new boyfriend and two young children were inside — trapping the woman and kids inside a bathroom until police arrived and fatally shot him, according to witnesses and the NYPD. Francisco "Frank" Carvajal, 47, burst into the seventh-floor apartment at 820 Ocean Parkway belonging to his ex-girlfriend, Katrina Russo, 35, and flew into a violent rage at 7:20 p.m. Monday, she and sources said. Russo grabbed two knives and her kids, a 7-year-old boy and a 6-year-old girl, and barricaded herself in the bathroom while begging Carvajal to leave them alone, police and witnesses said. "She was yelling, 'Help! Help! Help!'" said Tamara Begiyeva, a neighbor who lives in the apartment below who ran upstairs to intervene after hearing the confrontation. "She said, 'Frank, Please stop! Don’t hurt my children!'" Outside the bathroom, Russo's 51-year-old boyfriend, whose name was not released, was stabbed by Carvajal. The boyfriend called 911 and ran outside to meet the responding officers, sources said. The boyfriend led police back upstairs to the apartment, where Carvajal lunged again, stabbing the man in full view of police, sources said. Police ordered Carvajal to drop the blade, but when he refused to do so, they shot him, police said. Carvajal was pronounced dead at the scene, police said. NYPD Investigators were trying to determine if Russo's boyfriend was caught in the officers' gunfire when they shot Carvajal, an NYPD spokesman said. Russo's boyfriend was taken to Maimonides Hospital and pronounced dead, police said. Russo, who returned to the apartment on Tuesday to pick up her 5-month-old cat Cubby and some cat food, said the family is holding up as best as can be expected. "We're all right, all things considered," Russo said, adding that she was staying with relatives in the city. "The kids are not physically harmed, which is good. They saw everything." Russo and her two kids didn't require any medical attention after the incident, police said. Neighbors said they were still stunned by the sudden violence. "[Frank] was a very nice guy. I never thought he’d do all this," said Begiyeva, who said she tried to intervene in the altercation along with her husband but was told by Frank, "Get out or I'll kill you."